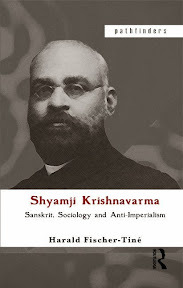 This book is the first critical biography on Shyamji Krishnavarma — scholar, journalist and national revolutionary who lived in exile outside India from 1897 to 1930. His ideas were crucial in the creation of an extremist wing of anti-imperial nationalism. HARALD FISCHER-TINÉ is Professor of Modern Global History, ETH Zürich. Profile page. Fischer-Tiné, Harald (2014). Shyamji Krishnavarma: Sanskrit, Sociology and Anti-Imperialism. Pathfinders. xxxvi, 228 S.